"I'm pleased to formally invite you to participate as a speaker during the second annual TEDxReno "Biggest Little Citizen" event on Friday, June 6, 2014 at the Lear Theater in downtown Reno. We really enjoyed your abstract and topic idea, and are looking forward to working with you to prepare a talk to inspire thought, passion and action from the people of Reno and around the world." That was the introduction to the e-mail I received from Meghan Pescio of the 2014 TEDxReno committee on March 31, 2014. This would be my third speaking opportunity of 2014 since the release of my book, For A Reason. The first was when I received the inaugural OM Foundation Award in February, and the second was for the 2nd Annual Baltimore Ravens Partner Summit in April. With the great honor of being invited to speak at a TEDx event, arose the question, "How do I condense 12+ years of my life into a message that needs to be conveyed in 10-18 minutes?" That's when the TEDxReno team became instrumental in helping me construct my talk, along with my sweetheart Tiffany Thiele. The TEDxReno team was comprised of some of Reno's finest community leaders including - Lance King, Doug Erwin, Meghan Pescio, Tony Gallian, Shyla Pheasant, Geoff Deal, Rory John O' Brian, Mark Hatjakes, and Brita Muller. At first I was only alloted 5 minutes as the final speaker of the event. But as the speech evolved it was decided that I would need at least 10-12 minutes to deliver the message. What I didn't anticipate was a re-awakening of emotions that had been dormant for over 10 years. These emotions surfaced when I conveyed the turning point of my recovery from brain cancer in 2002. Through countless rehearsals and revisions I received an abundance of constructive feedback. Saying more with less was critical to creating an impact along with the use of metaphors. The crafting of my TED Talk certainly forced me to become more creative. Other resources such as my Toastmasters Group and the team at ACCESS Event Solutions were helpful as well. One of the greatest things about this entire experience was all the new people I was able to learn from during the rehearsals, whether it was the TEDx staff or the speakers themselves. Everybody was on a journey and it was inspirational to see each person evolve. The speakers beckoned questions that demanded answers. What does sleep tell us about our country's state of happiness and productivity (my personal favorite)? Did you know that drones help save lives and money? Who would've thought that the Burning Man movement is becoming a powerful source of influence in the construction of our communities? One month prior to event. Equally as inspiring was the renovation of the Lear Theatre in downtown Reno. 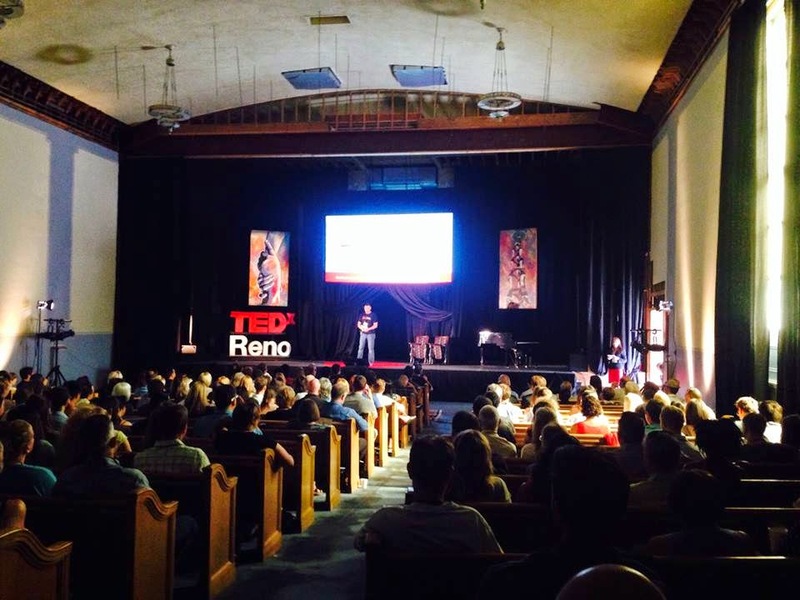 2014's TEDxReno event would be the venue's first in over 12 years. It's amazing how some curtains, a couple pieces of art, and a change in lighting can completely transform a room. During the lunch break of this event, Tiffany and I went to her apartment for one last rehearsal run. It was during this time we discovered the perfect ending, but you'll have to watch for yourself :) Enjoy! What cause do you support and why do you support it? Every one of us has the power to influence change and make the world a better place.